Information Services is pleased to remind you that when you come back on campus for the fall quarter, our labs and classrooms will be upgraded with Office 2013 and the Adobe Creative Cloud software suite. Macintosh computers in the classroom and lab environments will remain with Office 2011 for Mac, but will receive the same Adobe Creative Cloud software upgrades as the Windows computers. The Office 2013 suite will include the 2013 editions of Word, Excel, PowerPoint, Access, OneNote, Visio, Project, and Publisher. This upgrade will bring some new features in Office 2013 which you can read about here http://go.depaul.edu/office2013. The Adobe Creative Cloud upgrade will bring us the latest edition of popular Adobe software titles. Some of the included titles are: Adobe Acrobat Pro, Photoshop, Illustrator, Premiere Pro, Dreamweaver, Audition, Fireworks, Illustrator, InDesign and Lightroom. This upgrade brings continued enhancements to this collection of graphic design, video editing, web design and photography tools. For more information regarding the Adobe applications, please visit http://tv.adobe.com. We have also updated courseware offerings in the labs and classrooms. 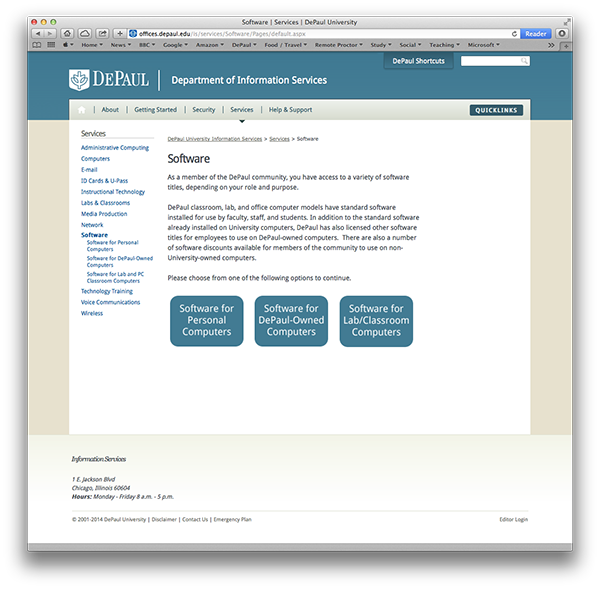 To find out which software versions will be available in the labs and classrooms, please visit http://software.depaul.edu. Additionally, Information Services is pleased to announce that Lynda Campus is now available for all DePaul faculty, staff and students. Lynda Campus provides unlimited access to a vast online library of instructional videos covering the latest software, creative, and business skills. Microsoft Office, Adobe Creative Suite, social media, web design, animation, photography, audio and video production, project management, and a wide range of other topics are covered. With Lynda campus, you can watch full courses or small segments of courses at your own pace. For more information about Lynda Campus please visit http://software.depaul.edu/training. If you have any questions, need help, or would like additional information on these upgrades, please feel free to contact softwarerequest@depaul.edu.